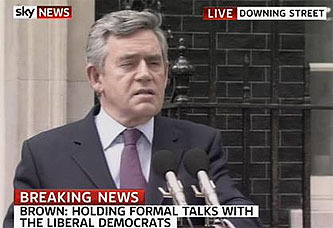 Gordon Brown is going to resign. He wants to stand down as Labour leader before the next Labour conference in the autumn. But he intends to remain as prime minister until then (if he can). Nick Clegg has formally opened talks with Labour. Brown said that Clegg rang him recently (presumably after the Lib Dem meeting) to say he would like to have formal talks with a Labour team. Brown is proposing a “progressive” government, comprising Labour, the Lib Dems, and presumably the SNP, Plaid Cymru, the SDLP and the Alliance. Electoral reform would be a priority. And so, playing Salome, Clegg has got Gordon’s head on a platter and we now have the extraordinary sight of the Lib Dems negotiating with both parties at the same time. This is madness and invites the public to view the Lib Dems as a party of political hoors prepared to sell their services to the highest-bidder for nothing more than self-evidently narrow, selfish interests. That’s their choice but it reduces their seriousness and seems likely to leave Clegg open to the notion that he’s no better, and perhaps worse, than any other politician. This invites all kinds of trouble for the Lib Dems at the next election. Constitutionally there’s no problem with having another “unelected” Prime Minister but having two in a row brought to power in such a fashion seems, politically at least, a rather different matter. And how on earth can Clegg agree to a coalition deal without knowing who the Prime Minister is going to be? So what the hell is going on? Perhaps as Philip Stevens suggests this is simply a wrecking maneovre by Brown. Whatever else it is, however, it’s not necessarily the kind of arrangment that is likely to leave voters more enthused about the idea of electoral reform. Stay tuned! It’s certainly more interesting than American politics at the moment.